Coleus is one of those magical versatile plants that everyone loves at first sight. While it is hard to find flowers that bloom all season long in sun and shade, Coleus will happily fill that role with its showy colorful foliage. Not to mention it is one of the easiest plants to grow, propagate, and share with friends! 1 . 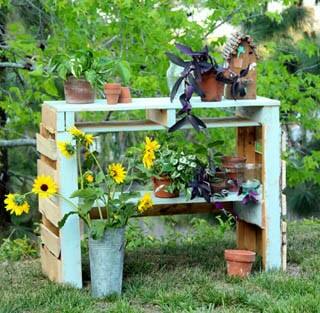 Make free plants! 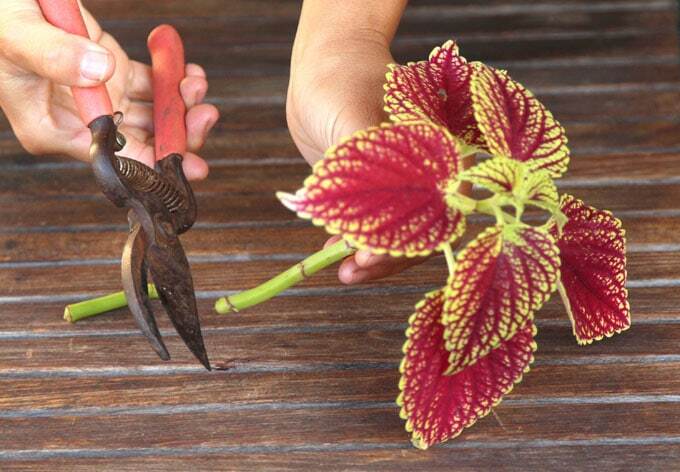 How to root Coleus from cuttings easily in 2 ways. 3 . Beautiful Coleus varieties and inspirations on how to use them in a garden. How to root Coleus cuttings easily in 2 ways. 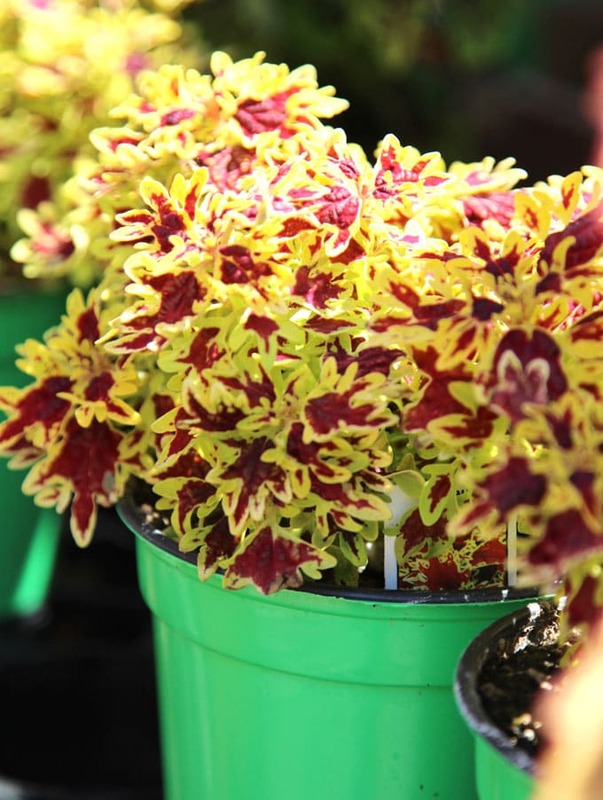 Coleus is unique in a way that it is fast growing, but fragile. 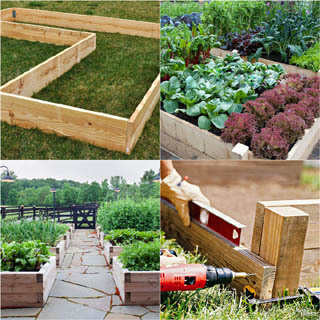 Tender stems can break easily when we move planters around in our garden. The good news is, those broken stems have become new plants! Step one is to select stems that have at least 2 more nodes ( spots where leaves grow out) under the top set of 4 leaves. See photo above. Remove lower leaves, keep the top set of 4 leaves. Now we have a cutting ready to be rooted. The easiest method is to root Coleus cuttings in water. Just place the cuttings in a glass jar filled with water. Make sure at least 2 nodes are submerged in water. 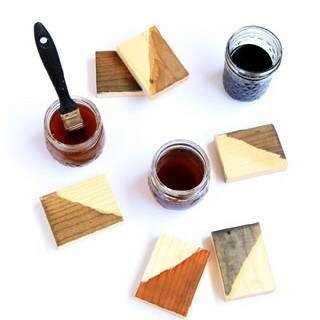 Place the jar in a bright place out of direct sun. 60 to 75 degree room temperature is ideal. 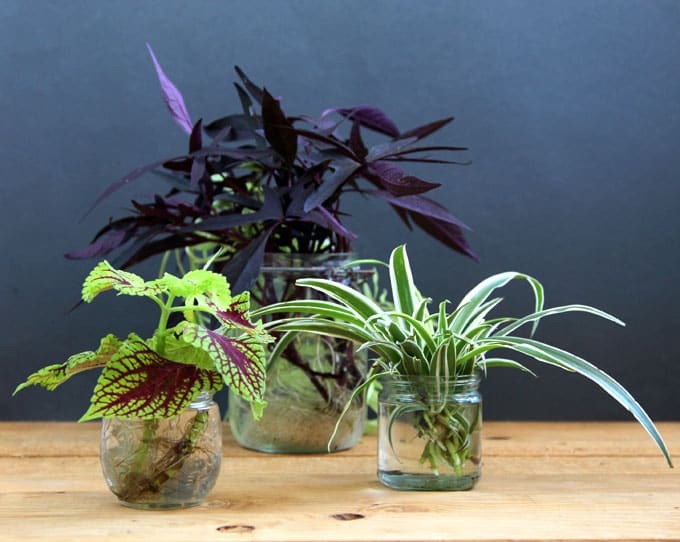 BTW, here’s a super cool trick: how to grow lots of these shade loving plants indoors in glass bottles and water! Most of the time there’s no need to change water. Roots will start forming in 2-3 weeks. If the water looks cloudy, you can change it with clean room temperature water. Plant the cuttings in moist potting soil when roots are about 1″ long. 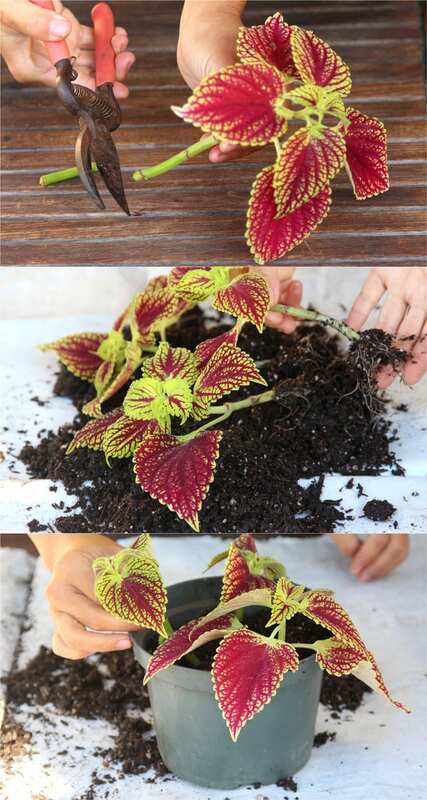 The 2nd method is to propagate Coleus cuttings in soil. Fill a pot with moist potting soil. 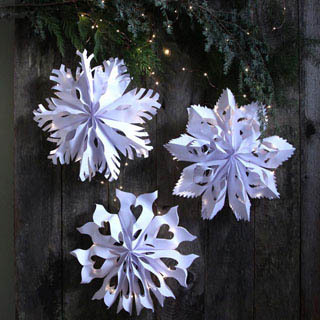 Use a pencil to poke some holes, and place the cuttings one in each hole. Make sure at least 2 nodes are below soil level. Place the pot in a bright place out of direct sun. 60 to 75 degree temperature is ideal. Keep the soil moist but not sitting in water.In about a month, the plants will be rooted. The challenge with the soil method is to remember to keep the soil moist. Otherwise, it is a super easy one-step process! 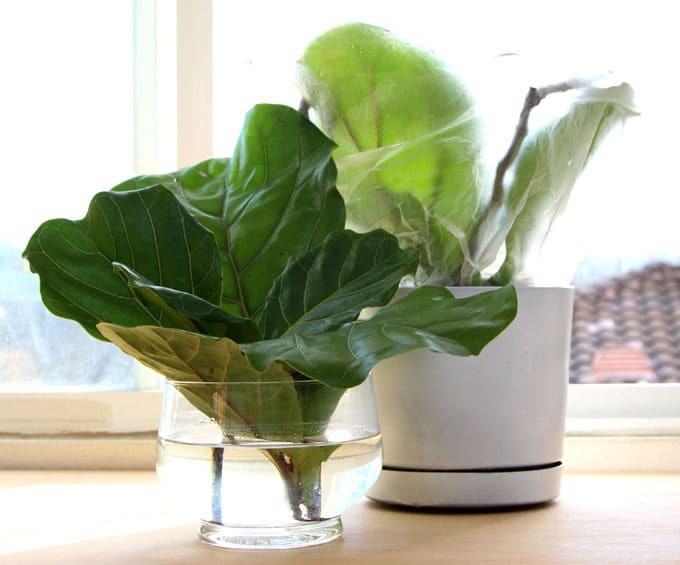 You can also create an easy humidity tent like the above, check out our tutorial on how to propagate and grow Fiddle Leaf Fig for more details. How to grow healthy Coleus: sun, shade, water, and soil requirement. Does Coleus like sun or shade? The short answer is : morning sun, late afternoon sun, or dappled shade are all ideal conditions. 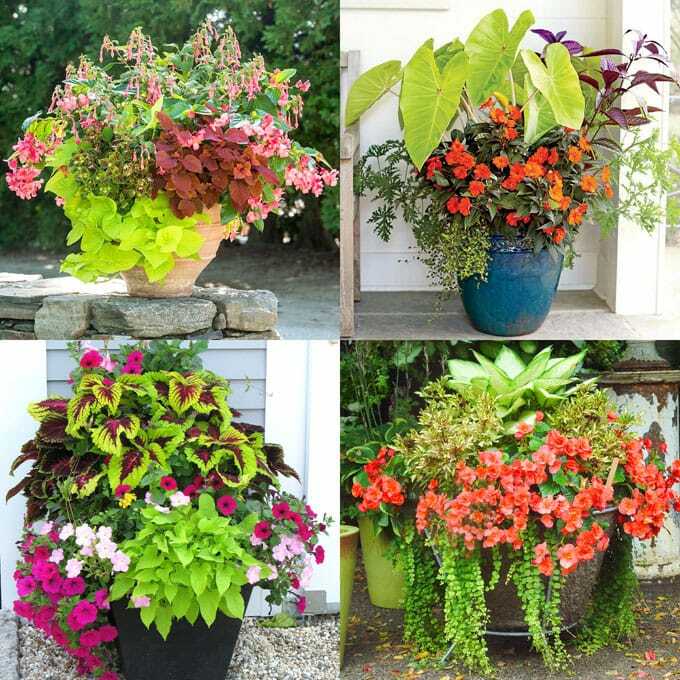 The above planters are featured in our recent post here- Best shade plants & 30+ colorful shade planters with complete plant list for each! Based on the short answer, you can vary the conditions a bit depending on the variety and where you live. Dark colored varieties tend to tolerate more sun, while lighter varieties need more shade. Here in sunny southern California, hot noon sun will cause leaf scorch, but in Pacific Northwest, Coleus can be grown in ‘sunnier’ spots because of low sun intensity. Observe your plant: when a plant is lacking in foliage color and has weak stems, it means too little light. Leaf scorch means too much sun. Coleus can drink a lot of water. It loves well drained, but moist potting soil. Give it regular water. Fertilize during growing season in spring and summer once every 1-2 months with an all purpose fertilizer. Great Coleus varieties and planting design inspirations. Such a magical variety of colors here from hot pink, to deep burgundy, to golden rust! 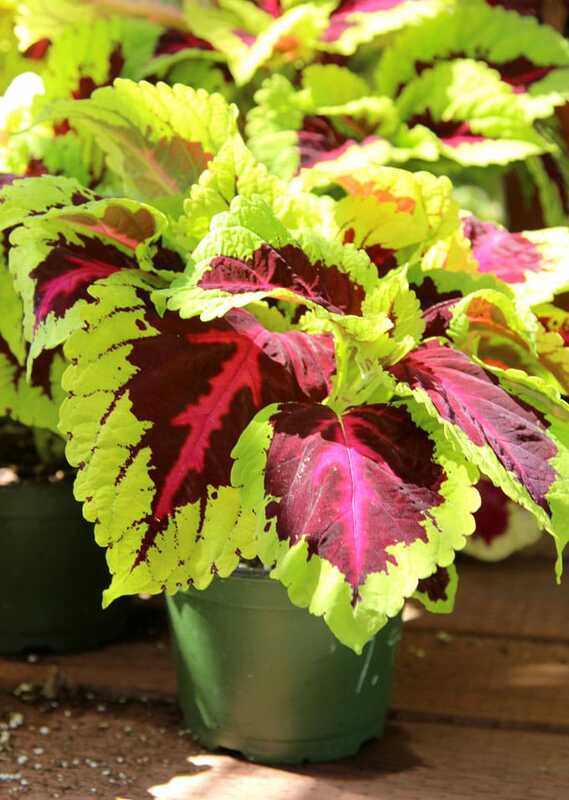 And don’t forget size variations: Kong coleus (Solenostemon scutellarioides “Kong Series”) has huge leaves 4 to 6 inches cross, ‘Ruby Ruffles’ has tiny, frilly, fine textured foliage about 1″ wide. The above planters are featured in our recent post here- Best shade plants & 30+ colorful shade planters with complete plant list for each! Lot’s of inspirations to check out! Best shade plants & 30+ colorful shade planters with complete plant list for each. 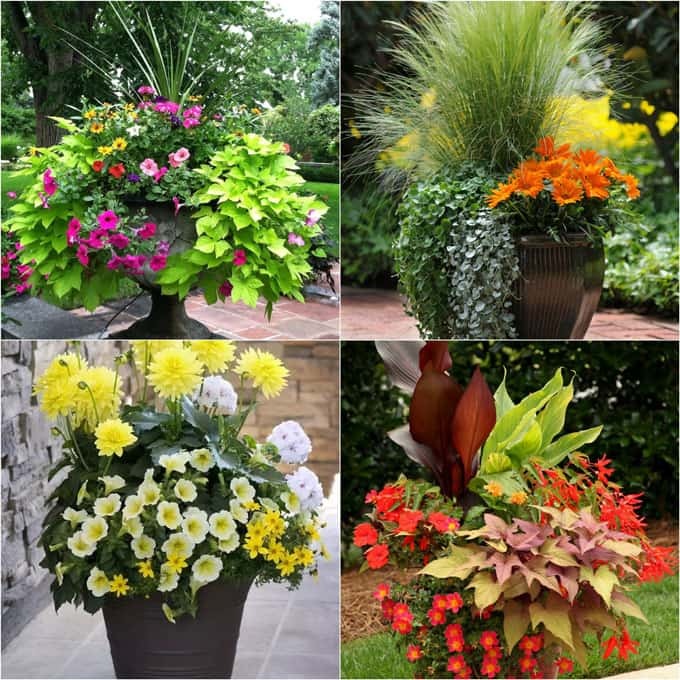 You may also like: 20+ Stunning container plantings for sunny locations, with plant lists of course! I bought one last year and kept it in the house. I love it so much,and yes I cut off the really tall ones and start over with a new. Now I have had these in the past and this didn’t happen but Everytime I cut off the ones that are going crazy and I was putting themin water. Now , Everytime I do so the colors change ! Why ??? I love it but it’s strange . Just woundering if this happened to you? hi louise, when i notice the color change it’s usually because some parts of the plant is exposed to more sun and some are shaded by its own foliage. ??? ?